I have all my blocks done, and so far (knock on wood) its turning out nicely and I love how the colors are coming together. The squares are 2.5”. I used a lot of the Amy Butler dots, and the rest were scraps. Mostly the weird shaped scraps I didn’t know what to do with but saved just to look at them. 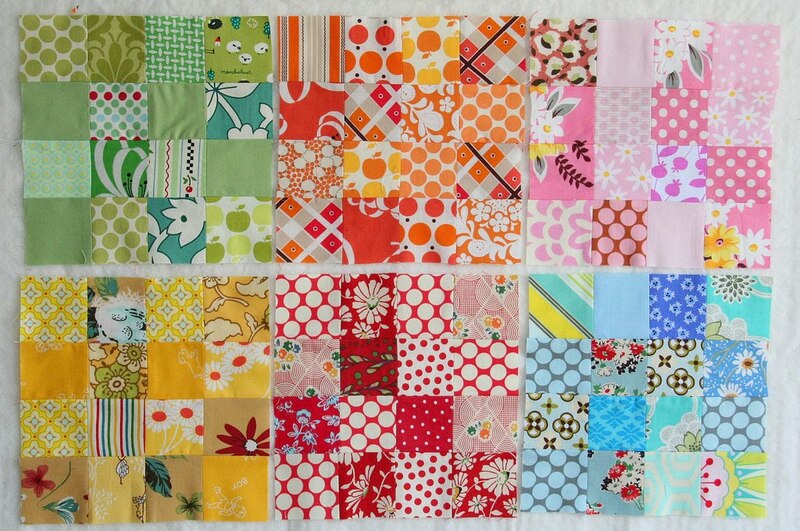 I will probably sash these in white, I have 30 blocks, so it will make a nice sized lap quilt. As with each new project I usually ask what my husband thinks before I sew it all together. This time he said, “Wow, good job cutting up the fabric and sewing it back together.” I’m guessing that’s his approval. And it made me chuckle because that’s all quilting really is….just cutting up fabric and sewing it back together. And its so much fun. these are adorable. the colors REALLY work together. Each block is gorgeous…and they’re going to be fabulous with white sashing! So fun and your photo makes me smile! Great color! This will be such a happy quilt!! 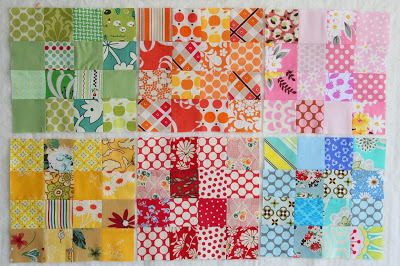 I love all the beautiful fabrics~ And using up your scraps is a double bonus! I love it, the colors are so pretty and I love the vintage feel of it. I made my husband read what you wrote about what your hubby said and we were both cracking up. These are the kind of comments I get when I show him a WIP! Can’t wait to see the result. I love it! Your site is so fun to browse, and I love your tutorials. Keep up the inspiring work! Love the monochromatic blocks! They will look fantastic in one big quilt! So bright! Love your fabrics! I wondered what you were cutting up all those squares for! Looks great! I love those squares. How can anyone throw away scraps, there are so many uses. That is the funniest comment from your husband! And I love those squares. I can’t wait to see them all together. This is fabulous! Such a great way to play with color. I think the blue one is my favorite. Can’t wait to see it finished with sashing and all. Ooh! I’m so glad you didn’t keep us waiting too long about what you up to with all those little squares. Your husband is funny! Fabulous! I can’t wait to see the quilt emerge. I think it’s going to be wonderful. What a great use for scraps!! Are the other blocks different color themes too? well glad you got to sew all those tiny squares into something very happy looking! My grandfather, who is no longer with us, was born in 1903. So he lived through two WWs, rationing, the depression, etc. He always said “I will never understand why you take a perfect good piece of cloth, cut it all up into little pieces and sew it all back together again.” Shaking his head the whole time. I cant wait to see the finished quilt. Great idea for your scraps. love it. My name is Tracy Jackson. I’m the Affiliate Marketing Manager here at Fabric.com. It’s our 10 year anniversary! In celebration we have our “Sew Much Fun Sweepstakes.” The grand prize is a trip to Italy. Yes, I said Italy! This link will take you and your readers to the registration page for your chance to win. Thank you “sew” much for your time. P.S. Would you like to earn up to 10% commission. Don’t leave money on the table. Email me at tracy@fabric.com or call me to discuss. What a smartass! ;) Sounds like something my husband would say.